Hi guys. I went to a local gun show today here in PA, not looking for anything in particular, but wanting to spend a little of my Christmas bonus on myself. There was a small batch of CZ-82's, all in about the same condition as the one I brought home. 1988 production, 2 mags (1 not original), leather holster, and cleaning rod. $325, plus tax and PICS. More than what I wanted to pay, but prices aren't going down, are they. If it shoots good, it may be a candidate for refinishing. One small issue needing to be resolved - the safety lever is very sloppy, without a firm click, and does not stay in place. It does function, and does not disengage, but it does concern me that it could easily become disengaged without my knowing it. I did a quick search here, and a thread mentioned a missing hardened ball. I disassembled enough to see the ball is in place, but it doesn't seem to make contact with the lever, nor does the ball have any movement. I'm not sure if it should have movement, but I am sure it should contact the lever. Any help is appreciated. You may get some info on the safety here. The 82 being same as the 83. Thank for the video, Blaiwayw! After watching a bit of it, I know the problem. Parts 35 Safety Latch and 36 Safety Latch Spring are not existing in my pistol. That explains the sloppiness, no doubt. Now to find them somewhere. Any ideas on a source? Awesome, thanks. I did find each one in stock at different places, but no one had both. I didn't think to check CZ-USA. Order being placed, but I think I will contact the seller and ask for the cost of the parts to be refunded. I think even a surplus gun ought not to have important safety parts missing. What do you think? I do think it’s an excellent candidate for refinishing, however. Get some new springs and bring it back to life! I received the latch and spring from CZ-USA today. I dry fitted the latch into the safety lever, minus the spring, and it required zero fitting. A bit of lube, some care in handling the tiny spring, and within 5 minutes the pistol was reassembled. Now the safety snaps sharply and firmly on and off, with no movement whatsoever in either position. I am much relieved, and now am comfortable taking it to the range. I just need to make some time. Thanks again for the tip on finding the parts, eastman. I finally got to the range today to shoot the CZ-82. It was a brisk and breezy 30 degrees here in PA, so it was a fairly quick trip, and my first trip to the range in a few months. I was shooting Fiocchi 95 grain FMJ. This first target is the first magazine through it for me. Shot at 25 yards since there were others at the line and I couldn't move forward. 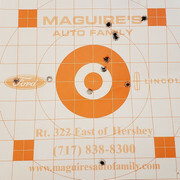 Not bad for 25 yards and a rusty shooter, I think. 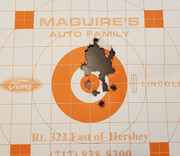 I shot a few more magazines at 25 yards, then, the range emptied, so I moved forward to 7 yards. Second target is two full magazines from 7 yards, probably shooting at 1 shot every two seconds, so not rapid fire, but not taking time on every shot, either. I think I am going to enjoy this pistol. Refinishing with cerakote, and carrying may be in it's future. Anybody have any feedback on good range and carry ammo. The Fiocchi worked fine, but just looking for info. By the way, the two factory magazines I have (with crossed swords, dimples, and no seams) worked flawlessly, but the one with mfg CZ (no swords, no dimples, and very visible seams) had a stoppage each time I used it. first time was in the middle of the magazine, and was fixed with a firm whack on the bottom of the grip. The second time was on the last round of the magazine. The last round wound up pointing straight up, but still in the magazine. Required locking the slide and dropping the mag to clear. I concur with others that the mags marked "mfg CZ" are garbage. Don't waste money on them. Hiya Rock-it, thx for the thread, congrats on the purchase and thats really excellent shooting at 7 yds.My platform was the last year they made the Cz-83, so assume its very similar. Your ammo choices will often depend on whats avail and how much you care to spend, but wall marts fed ammo should also run fine.I made the mistake of buying some steel cased russian ammo from wallmart it was cheap but didn't like feeding out of the mags.Your one mag may benefit by cleaning and lubing the spring. As far as carry ammo I preferred federal hollow points,dedicated a mag for the HP so I'd not need to unload it for range shooting.But the lack of penetration power of even +p kinda made it a backup at best. I also had safety work done as the right sided one was super tight,and Stu did a short reset and trigger job on it.The Marchel wood stained grips with thumb and finger grooves made it nice looking,but did suffer a vibrational crack of said wood at one side near thumb grip.Welcome to visit my profile to view pic in old post. Its a nice addition to your collection. Be well. My vz82 usually gets Brown Bear or Silver Bear (mostly Silver) for range use. PPU, Fiocchi and S&B are also good to go. I buy mostly steel case 9mm Mak since the Polish P-64 pistols I have will choke on the soft PPU brass. For carry, I have Hornady Critical Defense 9mm Mak loaded up. When I lived one state farther south, I shot my CCW qualification with the vz82. I've settled for Monarch from Academy for the range. Cheap consistent steel case. I usually hit it when it goes on sale. Thanks for the compliment, Adrian. From the things I have read on here, and from my experience today, I think it may not be worth it to hang onto a bad magazine. Maybe I will try to tweak it a bit to see what happens, though. I don't like lubing magazines though. It seems to me lube would collect dirt and grit, which could cause problems. Meguire's auto polish is good for making the insides of a mag slick, but not sticky. They are actually easier to clean after they are polished (carbon and gunk wipes right off). HA! I haven't polished a vehicle in years, so I don't have any Meguire's polish. I've never polished a car. One can of Meguire's is a lifetime supply of magazine maintenance.